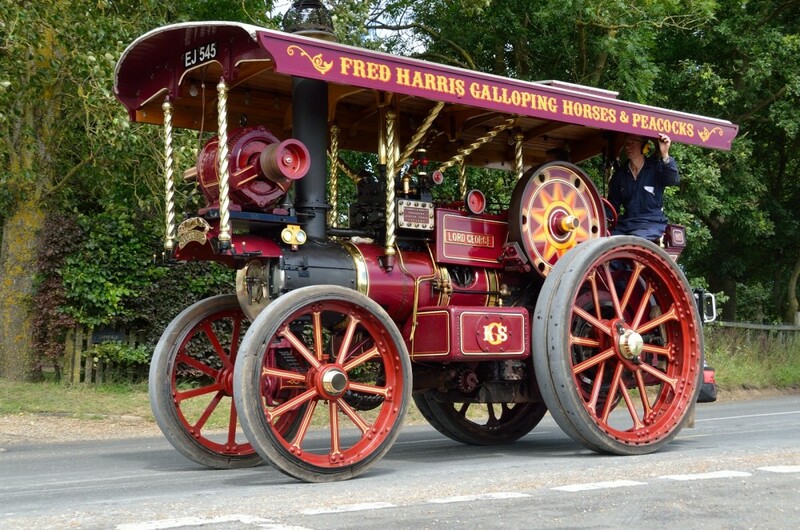 In 2015 the East Anglian Traction Engine Society marked its 60th Anniversary. The club has come a very long way since its first event, a dinner held at Silver End. This year the club held three events and attended several others with the sales stand. For the last few years, Audley End Miniature Railway hosted a small gathering of steam engines and historic vehicles in association with the society. This popular event, run by committee member John Hunt (and his team of helpers) outgrew the railway site so the decision was taken to move to a new venue just up the road. The new site just outside of Saffron Walden allowed the event to grow and the opportunity was taken to ‘rebrand’ as Saffron Walden Crank Up. The Crank Up was an amazing success; huge support was received from exhibitors, society members, and of course the general public. It was an excellent way to kick off our 60th anniversary celebrations, and hopefully the event will continue to thrive. A new sales stand was purchased around the time of the Crank Up, though it wasn’t ready in time for the event. It made its debut at Aldham Rally and was seen at several other shows throughout the year. Alterations are planned for the winter and will improve the look and feel of the stand for 2016. Our magazine Steam Preservation continues to go from strength to strength. The format has changed slightly over the last few years, with the Summer edition being run as a photographic special and the Spring & Winter editions as more standard magazines. This change has been welcomed by the membership and this year’s special focussed on our 60th Anniversary; a fitting way to mark the occasion and a souvenir for the future. The Society’s second event was held in August a road run. Our society has a great tradition of organising road runs and the committee felt that the occasion demanded another. The route chosen was a re-run of the 2012 Sudbury Road Run. The run was blessed with glorious sunshine and an excellent turn out of engines, models and vehicles. Wide coverage was received within the preservation press and all who attended had an enjoyable time.
. The dinner is an occasion for dressing up and having a good time. Awards were presented for serious and not so serious activities performed by individuals throughout the year. After three years of running the event Chris Brighty has decided to stand down and for 2016 the event will be run from a new location by Chris Webb & Alice Wheeler. Our AGM rounded off the year at the Museum of Power at Langdon. This year both our President (Keith Honour), and our Chairman (Chris Brighty) had announced their intention to stand down. Andrew Waling was elected as Chairman, and John ‘Smudge’ Smith as President. The opportunity was also taken to award Life Membership to Sue Doncaster; someone who has done pretty much every job on the committee and continues to work tirelessly for the Society and its members. Although that concludes the club’s 60th Anniversary Year, the committee would like to send our belated congratulations to John Hunt & Faye Setterfield, and Chris Pumfrey & Lisa Burgess who tied the knot recently. We wish both couples a long and happy life together.